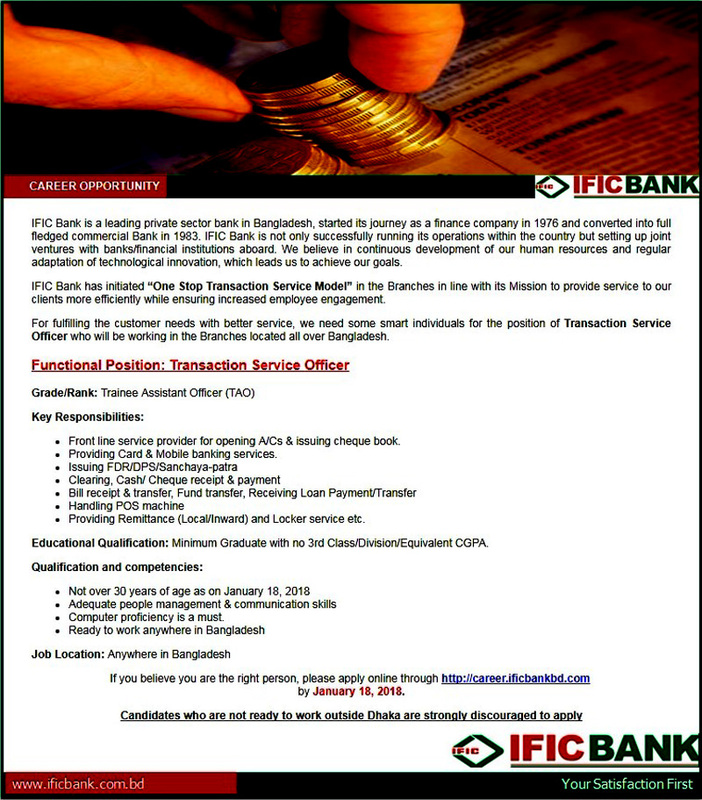 IFIC Bank Limited Job Circular & Apply Online 2018 – www.career.ificbankbd.com. The Latest Bank Job Circular of IFIC Bank Limited. The IFIC Bank Limited Recruitment Notice has been found my website http://allexamresultbd.com. IFIC Bank Limited job title are as Engineer Civil, Engineer- HVAC Fire and Pumps, Engineer Power, HR Operations. IFIC Bank is a first generation private sector commercial bank having joint ventures and affiliates abroad. It was set up as joint ventures between the Government of Bangladesh and sponsors in the private sector in 1976. IFIC Bank was converted into a full-fledged commercial bank in 1983. IFIC Bank has been published Job Circular Engineer Civil, Engineer- HVAC Fire and Pumps, Engineer Power. IFIC Bank is an equal opportunity employer and welcomes applications from female candidates. Any persuasion will disqualify the candidature. ■ Education Qualification: Minimum Graduate, Candidates waiting for Final Result may apply. ■ How to Apply: Candidates have to Apply for IFIC Bank Jobs through a particular Online Application Form provide by http://career.ificbankbd.com. ■ Age Limit: At most 30 year(s) as January 1st, 2018.